Alzheimer's is a disease caused by the progressive degeneration of brain cells resulting in reduced cognition and loss of certain brain functions. As the 6th leading cause of death among seniors in the U.S, Alzheimer's is a type of dementia that is debilitating and fatal. Overtime, day-to-day tasks become increasingly difficult until those tasks become impossible. Alzheimer's disease and other forms of dementia can affect one’s memory, judgement, ability to think and control emotions. This condition also leads to changes in behavior, affects social skills and reduces independence. Unfortunately, researchers have yet to discover a drug that reverses the effects of Alzheimer's disease once the symptoms begin to show. Yet, some of the latest research on whether blood can be used to test for Alzheimer's has shown promise and may help turn the tide for more effective treatment. 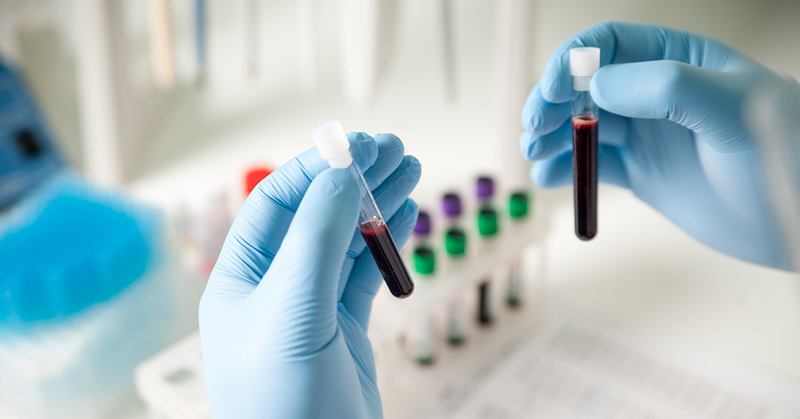 Continue reading to learn more about how blood is being used to test for Alzheimer's disease. The analysis of cerebrospinal fluid collected through the puncture of the lumbar, which is invasive and painful. Fortunately, a study presented in the journal EMBO Molecular Medicine describes a completely different way to test for Alzheimer's disease. One of the true clinical tell-tale signs of Alzheimer's disease is the irregular accumulation of amyloid-beta plaques in the individual's brain. While amyloid-beta is present in a normal, healthy brain; the protein accumulates and is folded incorrectly in the brain of those impacted by Alzheimer's. When this protein is misfolded in a sheet-like form, it becomes toxic to nerve cells. The development of amyloid plaques can start anywhere from 15 to 20 years prior to any Alzheimer's symptoms. The buildup of this unhealthy protein serves as the basis of the blood test for Alzheimer's disease. Led by Klaus Gerwert, a team of researchers wanted to discover whether measuring the levels of pathological and healthy amyloid-beta in the blood could potentially identify Alzheimer's in its early stage. They developed a blood test for Alzheimer's that utilized immuno-infrared sensor technology to extract all amyloid-beta from each blood sample. The initial phase of the study delivered results that were encouraging. For those who demonstrated subtle, early Alzheimer's symptoms — the test detected increased levels of the misfolded amyloid-beta and later confirmed it with brain scans. The next step was to see if the irregular amyloid-beta levels were able to be detected prior to any symptoms. In summary, the blood test detected Alzheimer's disease in individuals an astonishing eight years prior to any clinical symptoms becoming apparent. The blood test hailed a diagnostic accuracy of 86%. In comparison to the PET scan or lumbar puncture, the blood test would be simpler and more useful to clinicians. One of the major issues hampering Alzheimer's research is the disease is typically caught at a relatively late stage. This is because the symptoms of Alzheimer's disease slowly develop over time. In most instances, these symptoms become more obvious long after the disease has made permanent changes to the brain. However, the new blood test potentially can detect Alzheimer's disease up to eight years before any of the following clinical symptoms are present. At the Long Island Alzheimer's Foundation, we provide innovative services and programs to address all stages of Alzheimer's disease and other forms of dementia. All of our programs are based on the latest and most effective research and features a range of preventive interventions. Our goal is to make a positive difference in the lives of those impacted by Alzheimer's and other forms of dementia — one person, one family, one community at a time.